The group head gasket sits up in the group head, and provides the seal between the group and the basket lip. The group head gasket may only last about 6 months, as the constant heat causes it to become brittle and this results in leaks from the portafilter when pulling a shot. Here we show the replacement procedure for the Gaggia TS, but this will be identical for any of the Gaggia domestic machines, including the Classic and Baby. Incidentally, the gasket is available in thicknesses of 8.5mm (standard) and 9.0mm (for older machines where wear of the group and portafilter needs to be taken up). The internal diameter is 56mm and the external diameter is 72mm. Different size gaskets are used for the Gaggia Cubika, Viva and Gran. First remove the shower plate. This is normally held in place by a slotted or Philips screw, but these can be difficult to remove after a time, so it’s recommended to replace this with an allen screw. With the shower removed, you can access the divider. Remove the two allen screws, and this will come away as well. You can see below that the divider has been damaged by a previous attempt to remove the group gasket. Finally, with care use an awl or a small screwdriver to lever out the old group gasket. It obviously does not matter if it is damaged, but make certain the slot in the group is clear of all remains. A mirror and a torch can be useful here. You can see here that the old gasket has a noticeable wear groove and is very brittle. Lubricate the new gasket with washing-up liquid, and insert it rounded surface upwards, inserting it into the slot starting at the front of the machine. With luck it will just push into place. If not, carefully work the gasket around, taking care to ensure the gasket fits squarely into the slot. Using a blunt tool, working from the edges of the bulge, guide the remaining part of the gasket into place. Reassemble and flush with water to remove traces of washing up liquid. We are often asked if commercial portafilter handles can be used in Gaggia domestic coffee machines such as the Classic. The answer is that most often this is possible. The Classic, Baby and Pharos machines will accept domestic or commercial handles. The exceptions are the Cubika, Viva and Gran models, which use a smaller portafilter body and are not compatible with the professional machines. The photo above shows the Gaggia Baby portafilter body, with the H-shaped handle fixing and the commercial portafilter with an M10 handle thread. Both accept the same size baskets and use spouts with 3/8″ threads. The plastic handles for the domestic machines are fragile and have been difficult to obtain in the past, but we now have a good stock of replacements. They are held in place with a M6 screw (we use an allen screw as these are easiest to line up if you have the correct tools, but most M6 screws will do – just make sure the thread is about 10mm long). If you want to use the commercial handle these stand up far better to the conditions encountered in a coffee shop and are a great choice for home use. You can mix and match handles, spouts and baskets to you heart’s content – and of course bottomless portafilters are available as well for you to really see how your shots are progressing. D1=62.3mm, D2=70mm, D5=79.4mm, T1=6.5mm, T2=24.6mm, T3=3.5mm. This is a quick look at the internals of the Vibiemme Domobar espresso machine, the one with the single boiler which you heat up to about 90deC to make your espresso, and then switch it to steam and allow it to further heat up to 145decC for you to foam your milk. I explain this, because there is also a version with a larger boiler and a heat-exchanger which allows the simultaneous brewing of coffee and steaming of milk. I have some internal photos of this machine also and will post them shortly. Beneath the top cover is the water tank. This sits on a sprung platform, and unless there is sufficient water in the tank it will not press down sufficiently on the micro-switch below the sprung platform. The prevents the element from heating up and causes much frustration. Here is the sprung platform removed and upturned to show the screw which presses on the micro-switch lever arm. The micro-switch sits under the water tank and sprung platform. Unfortunately, the lever arm can become bent, and this can make the machine think that the water tank is prematurely empty. Here is a first view of the boiler, to help you get your bearings. The group head is heated by thermo-syphonic action and has two copper tubes forming a circuit via the boiler. With the boiler up to temperature, the heated water will flow through the group head without the need for any pump, and so keep the group at the perfect temperature for brewing. The two pipes to the group connect to the boiler approximately half way down on either side. The steam valve is fed from the centre tapping at the top of boiler, and is connected to the separate steam arm. Within the boiler is a thermostat pocket, which accepts the vial from the capillary thermostat situated at the top right. This sets the coffee brewing temperature and has an adjustment accessible from above.. There is also a bimetallic steam thermostat screwed to the top of the boiler, which opens at about 145degC. The Vibiemme uses an Ulka EP5 water pump, which is able to provide up to 15 bar of pressure. This is reduced with an Over Pressure Valve (OPV) to around 11bar, which bleeds water back to the water tank to reduce the system pressure. It is recommended to reduce the brewing pressure to approximately 9 to 10 bar, but to do this it may be necessary to disassemble the OPV and cut a turn off the spring. We hold stock of spare parts for the Vibiemme Domobar, including the element (1800W), brew capillary thermostat, shower screen, group gasket, Ulka EP5 pump, power switches, descaler cartridges, and bottomless portafilter. You can descale Gaggia coffee machines by filling the water tank and running through descaler solution, but it is far better to remove the boiler so the extent of the scale build up can be seen. Any solution capable of removing scale will case some damage to the metal it comes in to contact with. By disassembling the machine, the descaling solution can be in contact with the parts for the minimum amount of time. First, disconnect the power and remove the lid/funnel arrangement by removing the two screws at the rear of the lid. Once inside, it is recommended to mark the wiring connections to the thermostats and boiler elements. 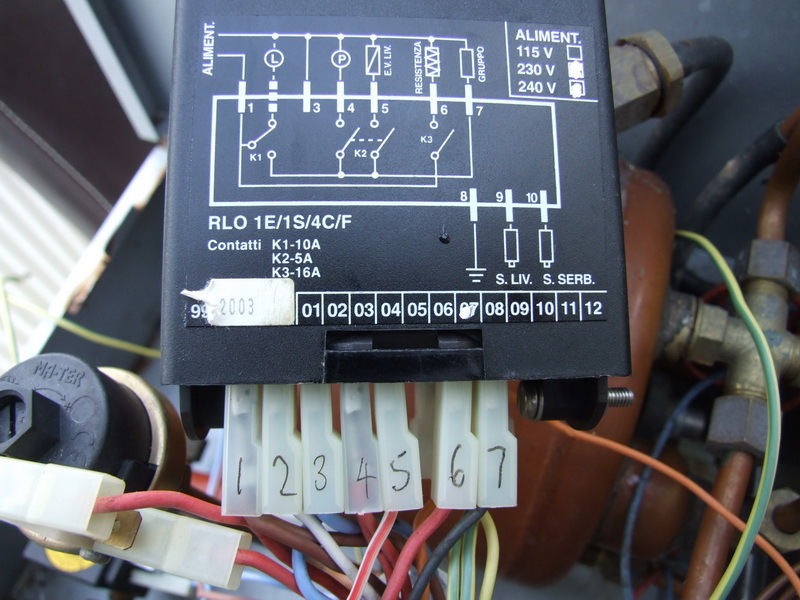 You can see the connections to the steam thermostat are marked with black dots, and the element connections have been marked with stripes. With the wiring marked up, proceed to remove the steam knob. Remove the four allen screws securing the boiler in place. The boiler can be removed as one piece once the wiring has been disconnected. Split the boiler and replace the o-ring seal. Upturn the boiler, and fill it with descaler. Depending on the strength of the descaler, and the extent of the scale, it can take anywhere from 20 minutes to several hours for all the scale to be removed. As soon as the descaler has completed its task, pour it away and thoroughly rinse away any residue to prevent further chemical action. To clean up the group head, remove the shower screen centre screw. Beneath the shower screen is a plate held in with two allen screws. At this point the steam valve can be seen. This is often blocked by pieces of scale, or the rubber becomes brittle, either way it results in leaks. This also a good point to replace the group seal. At this stage, I would clean the valve and hope that a leak-free seal results. If you need to replace the valve, a large flat blade screwdriver will be needed to remove the body of the valve from the group head. Following reassembly, thoroughly flush the system. I would suggest running a full tank through before making any coffee. In 2010 a coffee machine ruptured in a supermarket in Hampshire. Luckily nobody was killed, but the picture above does certainly indicate the level of forces involved and the possible results of safety mechanisms failing to operate. There is an excellent discussion on the potential legal pitfalls of operating a coffee machine in the following document. It discusses who you should employ to test the safety systems on your machine and where the liabilities lie. Coffee machines should be provided with two safety systems to protect from boiler explosion, in case the normal control system fails. For a coffee machine with a heat exchanger, the the pressurstat controls the operation of the heater. Should this fail (contacts welded closed, diaphragm split) then the element will remain powered. This fault is protected against by a non-self-resetting thermostat (ie you have to take the cover coffee machine and press a button to reset it) and a separate safety valve to release excess pressure to prevent the boiler rupturing. Alternatively, two separate safety valves may be used as in the Azkoyen Bravo for example (below). Setting up a commercial coffee enterprise? There is some excellent information on setting up commercial coffee machine installations at Espresso Underground (I am not connected with them in any way). These guys clearly have a lot of experience in this area, and there are some great tips to avoid making errors for newcomers. If you are trying a bottomless portafilter for the first time, and it pours coffee out everywhere, and you don’t obtain the beautiful coffee flow that you expect, it may not sound like it, but this is good news. 1. between the rim of the basket and the rubber seal in your machine (may be dribbles of hot water or squirts). 2. squirts of coffee in all directions from the small holes in the basket. If the leak is between the rim of the basket and the rubber seal in your machine, then it is time for a new seal in your machine. These become hard over time and require replacement every 6 -12 months. Of course check the top rim of the basket to make sure it is smooth and undamaged and the gasket area in the machine is cleaned regularly with a stiff brush to remove accumulations of coffee debris. If the coffee is squirting out in all directions from the holes in the basket, the the problem is down to the coffee used or technique (or both). The bottomless portafilter is designed to let you see if there are any problems with your shot. These problems are normally covered up with a standard portafilter – all you can see is what emerges from the spout. Thankfully we have come across this a few times and there are a few easy steps to a solution. The problem is often down to the coffee grind/freshness and the tamping. You will need a freshly ground bean. If you do not have your own grinder, I would recommend getting an espresso grind coffee from a local delicatessen, or from Whittards. The beans should be fresh (roasted withing the last week or so), and once ground they should also be used within a week or so. Any longer and they will dry out and loose all their oils and flavours. Your coffee pack should have a “Roasted On” date, and ideally you should use it between 1 week and 1 month from that date for optimum taste. If it has a “Use By” date it could have been roasted anything up to 6 months ago. The ground coffee in this case will be dry (devoid of oils) and will be very likely the cause of all your problems. You won’t get good crema, as few coffee oils remain, and the dry powder results in channeling and coffee spraying out of the basket. Don’t use Lavazza or other pre-ground as you will be spoiling your chance of a incredible cup of coffee. The next thing is the tamping. With the coffee machine good and hot (ideally 30 minutes of warming time with the portafilter in place), fill the portafilter basket, and using a flat based 57mm tamper (for our Gaggia bottomless portafilters), tamp the grinds down with a reasonable force (30 pounds or 15kg of force). You can practice this on the bathroom scales. With fresh coffee, and a good tamp, the puck of coffee in the filter basket should stay in place if the portafilter is turned upside down. Too old (ie dried out) and the grinds will not stick together as all the oils have been lost due to evaporation, or insufficiently tamped meaning the grinds are not pressed tightly together forming a uniform layer for the hot water to pass though. This will lead to cracks forming under the pressure of the water passing through and small jets of water spraying out to the side of the basket. Insert the portafilter in the coffee machine and run the hot water through the for 20 seconds or so, and you should have a perfect shot. If you look at the underside of the portafilter when you start the shot, the dark coffee should emerge slowly after a few seconds. This will form one or two trickles (described as mouses’ tails). Continue to let the coffee flow until you can see the dark brown coffee lighten, with just small streaks of dark coffee running through. At this point (the “blonding” stage) you should consider stopping the shot. Of course, you can improve on the steps above, but this is just to get you used to something close to a good extraction. Here is a short video of a customer with coffee spitting everywhere. This is due to dry old coffee and under-tamping. The main problem the buyer had was using a rotary grinder which gave variable grind size, the coffee was rather dry, and the tamping was insufficient. If you are finding fine grounds in the bottom of your coffee cups, it is a pretty good sign that your grinder burrs are very worn. Apart from the presence of the fine grinds in the coffee, the flavour will probably be noticeably affected, tasting more heavily roasted and probably burnt tasting due to the extra abrasion of the burrs. Here are a new set of Azkoyen burrs, with an external diameter 64mm and an internal diameter 37mm. Thickness is 9mm. It is common for burrs to have “spots” of oxidization from exposure to air; this is due to the hardness of the material used and does not mean that the burrs are inferior in quality in any way. A new set of burrs is good for 2500kg of beans. The burrs of the Azkoyen grinders can be exchanged in about 1hr, without any special tools. It is also a good chance for a thorough clean of the inside of the grinder. Close the door of the coffee bean hopper, by turning the metal bar within the hopper itself. This will minimise the spillage of beans when the hopper itself is removed (using the screw at the rear of the hopper). Undo further screws to remove the top cover and rear cover of the grinder. Mark the position of the grinder housing and body with a pen mark, and use the front panel grind fineness knob to unscrew the white housing holding the grinder teeth. This does take a while. With the white housing unscrewed, it takes about three turns, the burrs can be replaced (each is held in place with three screws). Here are the new ones installed. When screwing the upper section back into place, apply even pressure to the white plastic section, whilst turning the adjuster knob. One full revolution may be required for the thread to engage. Continue to tighten, until the burrs are touching, then back off until the pen marks are in line. If you need new burrs (ebay item 161004723483) then we have them in our ebay shop. Here are a couple of essential pdf files if you have the Azkoyen Capriccio (also previously known as the Molino M-02). The technical manual deals with the maintenance and repair of the grinder (including burr replacement). The programming manual deals with how to setup the coffee dose, allow pre-grinding, etc. The Gaggia three way valve is attached to the side of the group head on many coffee machines, and operates to route the hot water through to the coffee puck when pulling a shot. At all other times, the solenoid valve is de-energised, and routes any remaining pressure above the puck to the drain so that you can safety remove the portafilter after the shot without being sprayed with coffee resulting from the residual pressure. To check its operation, you should also be able to hear the metal slug inside the solenoid moving as the supply is applied and removed at the start and end of the shot (you may want to disconnect the pump so you can hear the solenoid operating). If you cannot hear this, then make sure volts are delivered to the solenoid whilst the shot is being drawn. The voltage will be either 24Vac, 110Vac or 230Vac (230Vac for the Gaggia Classic), so you need to be competent in the use of a multimeter in the presence of mains voltages. The voltage should disappear as soon as the shot is complete. If this is correct, remove the solenoid, and blow into the drain port. Your breath should exhaust through one of the ports (see diagram below). If it is still not working, then there is most likely some debris in the small internal galleries of the valve, either small pieces of scale, coffee grounds or rubber resulting from the replacement of the portafilter gasket. The diagram below shows the internal arrangement of the 3-way valve as used on the Gaggia Classic and other models. If you have a professional machine, the mounting flange may be different, but the operation will be similar. Here the ports are marked 1 and 2, with port 2 normally closed when the coil is de-energised and the flow being from port 1 to the drain. The slug inside the valve has a washer on either end, and due to the spring, is normally resting on port 2 completely sealing it. When the supply is connected to the coil this causes the metal slug to move against the spring force, and opens port 2 allowing flow between port 2 and port 1. At the same time, it comes to rest against the third port at the top of the valve (which runs to the drain), sealing that off. 1. Are there volts to the solenoid whilst pulling a shot? 2. Can you hear the solenoid slug moving when starting and stopping the shot? 3. If you push an unfolded paper clip into the drain opening, does it get pushed out when the valve is energised? 4. With the solenoid removed, can you blow freely through from the drain to one of the ports? If the answer to these four questions is yes, then if there is still a fault there must be debris blocking the remaining port (the port from the boiler). This is the smallest port (only about 1.2mm diameter, so is likely to be the first to be obstructed, generally by scale). The remaining two ports are about 3mm in diameter, and so are less prone to blockage; any debris on this route are filtered by the shower screen. If the coil is weak, the washers are worn, or for some other reason the valve is not working correctly, then we have replacement 3-way valves for Gaggia or other makes, in our ebay shop. Looking at the state of the existing group gasket and screen, I would be surprised if they have ever been replaced. The gasket is brittle and cracking and the screen is so blocked, I doubt if that has ever been backflushed either. With a new gasket (dimensions 73mm x 56mm x 8mm) and a replacement screen, the fit of the portafilter should be much better and there will be no chance of rancid off-tastes from the old coffee deposits. An alternative to screen replacement is a long soak in Puly Caff. Whilst you are cleaning, it is worth removing the centre screw and spray divider in the group. This was cleaned with Pully Caff, then a brass brush and a screwdriver were used to gently remove any remaining deposits. Finally, the Azkoyen shower screen and gasket are in place. In fact I used a Faema E61 gasket here (common to many makes of machine), which fits okay and the portafilter handle seats well, although you need to exert some force to get it to seat straight out from the machine. I think this will ease over time. To program hold down Prog button (on right touch pad). The green light next to main power switch will flash. Select the required coffee size/type, then press Stop when desired dose reached (repeat for each button). Tip: have the coffee in the group ready to go as the programming mode doesn’t last that long. I’m very please to have picked up an Azkoyen Bravo 1-group for only £67. Listed as spares or repair, if has obviously been dropped in transit at some point as the legs are severely bent, and the chassis panels don’t line up. However, before wasting time on straightening it up, I wanted to see if it was working. 2. Joints and hoses that leak and will spray water or hot steam on humans, electrical wiring, and your new flooring. This may not necessarily occur immediately, and may result from solenoid valves opening, pressure in the system increasing as it is heated, and so on. 3. Safety systems designed to protect you which are bypassed, faulty or non-operational. First task was to check the electrical safety. This machine can operate on single or three phase, and so there is a diagram below the drip tray which shows the connections. The earth connection to the chassis was in place and well made. The mains wiring to the main isolator was in good condition. For single phase wiring, the two live wires in the mains lead are coloured black, and the neutrals are coloured brown and blue. This wiring just fits in a British plug for testing purposes, but really a new mains cable is required corresponding the the standard UK colours of Brown (phase) and blue (live). The current draw in this configuration is 11A, so a 13A fuse is fitted to the plug. The wiring fitted the plug and it is safe for testing purposes. The mains cable enters the coffee machine through a gland in the base plate, and connects to the main power switch. This has a protective plastic cover around it, and then has a metal protection plate above. You can see the element here, with the three supply connections on the right. The three connections on the left are from the pressure-stat. You can see there are three element loops, allowing operation on single phase or three phase. The output of the power switch (three switched live feeds) pass to the pressure-stat and then to the elements in the boiler. The pressure-stat has three contacts which are closed when the boiler pressure is below 1bar. The contacts open at 1bar, and then do not reclose again until the pressure is below 0.5bar. The pressure gauge can therefore be normally seen fluctuating between 0.5 and 1bar. It also means that the elements are powered whenever the supply is switched on, and the boiler pressure is less than 1 bar. If the boiler is empty, there is nothing to stop the elements coming on and burning out ! In positions 1, 2 and 3 of the mains switch, the control board is powered. This board monitors the water level in the boiler, and runs the pump and opens the fill solenoid to fill the boiler until the level probe is immersed in the water, at which point the pump and the solenoid are switched off. In case there is a fault with the level detection in the boiler, the fill cycle only runs for 30 seconds or so. This does not normally matter, as pulling a few shots and steaming some milk will only require the pump to run for a very short time to replenish the boiler. If the boiler is empty, it is necessary to switch the mains off and on again a few times to allow the boiler to fill up to the probe level. If the coffee machine has been sitting around for a while, the pump can seize up from under use. It can be freed-off by inserting a large screwdriver in a slot in the end of the pump shaft and turning the shaft by hand (do this with the power off). By the way, when you turn the power on, the green led by the power switch lights after about 3 seconds (as does the red flashing one on the pcb). The pump does not start for a further 5 seconds. After the power has been on for a minute or so, the boiler elements should be heard starting to sing. After 10 or 15 minutes, the anti-vacuum valve will start to weep a little and then should lift and seal the boiler as steam pressure starts to build. The pressure gauge will indicate an increasing in pressure and at 1bar the pressure-stat should be heard to click open and the elements will stop singing. If left, the boiler will cool and the pressure will fall and at around 0.5bar the pressure-stat will close and bring the boiler back to 1bar. If the pressure stat should fail to open for any reason (blocked pipe, split diaphragm, welded contacts, etc) the boiler pressure will continue to rise. At 1.5bar one or both of the pressure release valves on the top of the boiler will open to safety release the pressure before the boiler ruptures. Needless to say, if you witness this happening, switch the power off immediately and do not re-power until the coffee machine has been professionally looked at. Opening the hot water tap draws water from the lower part of the boiler. Opening the steam tap draws steam from the top part of the boiler. Operating any of the coffee buttons on the control panel runs the pump with the fill solenoid closed. Cold water therefore enters the boiler heat exchanger via the injector and is heated by the large body of water in the main boiler cavity. This pressurised water, now heated, passes to the group. The solenoid on the side of the group is powered and allows the hot water to pass to through the screen and therefore through the coffee. A flowmeter measures the quantity of water flowing, and stops the pump as soon as the required volume has passed. At the same time the group solenoid is de-powered, and allows any residual pressure above the coffee to be released to the drain. The boiler can also be drained, before storage or transit, by opening a valve which runs to the drain (only do this when the boiler is completely cold). The group solenoid also runs to the same drain tray. After each time you “pull a shot”, the residual pressure inside the portafilter is released by a solenoid valve, which allows the waste water to flow to the drip tray and prevents you being covered in hot coffee and grounds when you unlock the portafilter. Over time, coffee residue builds up in the group filter screen, group head, and the solenoid valve body. This does become rancid fairly quickly, and leads to off-flavours in your shots which are definitely noticeable. The way to clear this residue is to use a cleaning powder such at Puly Caff, which you place in a special portafilter basket without holes (called a blind basket). If you place about one teaspoon of the cleaning powder in the blind basket, and pull a “fake shot”, the hot water flows on to the cleaner which dissolves and foams up pushing cleaning foam into the screen, group and passages of the solenoid. Because the blind filter has no holes, there is nowhere for the water to go, until you stop pulling the shot when the dirty water is released into the drip tray. This process is called backflushing. We make about 10 coffees a day with the Gaggia TS, and backflush the machine once a week. Here are some photos of the process. First we replace our standard portafilter basket with the blind basket, and load it with about one teaspoon of the cleaner. Next switch on the coffee switch for about 10 seconds. Hot water will enter the group and dissolve the cleaning powder which then foams up. When the switch is turned off, the cleaning solution flows to the drip tray. Repeat the process turning the switch on for 10 seconds, then off for 10 seconds, until the water flowing to the drip tray is substantially clean. Finally, turn the switch on and loosen the portafilter slightly allowing the cleaning water to overflow the portafilter and rinse any remaining coffee grounds into an old cloth. Beautiful coffee flavours result ! I have been searching all over the web for a free copy of the Gaggia TS spare parts pdf, but there are so many links to sites who want to charge you for someting which should be available for free. The Gaggia TS grouphead is unusual in that it is electrically heated, with an 80W element inside and a thermostat mounted on the top. Other manufacturers use a group such as the E61, which rely on a thermo-syphon system to keep the head at brew temperature. There is a pipe circuit through the head and boiler forming a loop. Heated water flows around the loop through convection, keeping the group warm. The TS group only has a single feed of water from the boiler heat-exchanger, and so would not be heated as quickly or efficiently as the E61 with its circulation loop. The element thermostat is fixed at 103degC, although other values can be substituted to suit the users’s taste. On the side of the head is the 3-way valve. This provides a route for the pressurised water from above the coffee puck to flow to the drip tray after the shot is completed, so the user is not sprayed with boiling hot coffee under pressure when they remove the portafilter. Once a week it is recommended to backflush the group head (using Puly Caff or similar), to remove stale coffee residue in the screen, group head, and 3-way valve. If you are looking for a replacement portafilter for you Gaggia TS, the good news is that the TS will accept a portafilter with the same dimensions as most other Gaggias. As far as I am aware, Gaggia use two sizes of portafilter, one for the commercial machines and most home machines such as the Classic, Pharos, and Baby. A smaller portafilter design is used with the Cukika, Viva, and Gran. The Gaggia TS was working well, and providing excellent espresso, probably due in part to its electrically heated group head. However, today the boiler heated up to pressure once, and then cooled right down until it was back at zero pressure. First check is to make sure there is water in the tank, and that the boiler has filled sufficiently. It may be (depending on the controller fitted) that the controller only allows the pump to run for a fixed period each time, so if the boiler has been drained, one run of the pump may not be sufficient to fill it. To check, switch the power off for 10 seconds, then turn on. The pump should not run if the boiler is full. The boiler has to be full (ie touching the sensor probe) to allow the element to be powered. Having determined that the boiler had filled, looking at the circuit diagram, the control unit provides a live feed to the pressurstat, which then connects to the element, and then through an overheat thermostat back to neutral. My problem was that there was no live feed to the pressurstat. This feed originates at the control unit, which switches its live feed (coming in on pin 1) out to the pressurstat (connected to pin 6) via relay K3. The most likely fault was a dirty contact of relay K3 so I began stripping down the control unit to see if I could repair or replace the relay. First I labelled the connections to make reconnection easy. The after removing the control unit, the cover can be unclipped to reveal the two PCBs. One PCB has the mains wiring connections, an 18V transformer which is regulated down to 12Vdc and relays K1, K2, and K3 (labelled on the PCB as RL1, RL2, and RL3. The other PCB has circuitry to detect the level in the water tank and boiler, and driver circuitry for the three relays. The interconecting ribbon carries 0V, 12V, and the three relay feeds. Here is the bridge rectifier, input capacitor, and regulator. Here are the three relays. Each has a diode (1N4148) across the coil (bottom right of the picture). The beige one drives the heater. On the second board, there are three transistors to drive the relays (they ground the relay coils down to 0V to switch the relay on). The remaining three pins of the ribbon cable are +12V, and two ground connections. Here is the remainder of the measurement board.